As a parent, you most often learn on the fly while you raise your kids. Luckily, we can all learn from the mistakes of others. And, thankfully, there are many parents out there sharing some simple hacks to make your life easier and your kids safer. Check out these life-saving hacks that you’ll never forget. 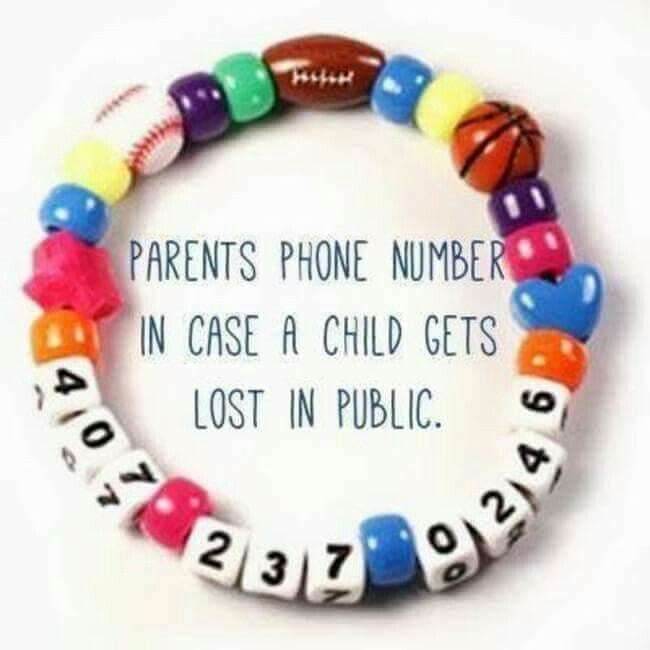 Make a safety bracelet with your phone number on it, and make your kids wear them when you go to crowded places. Just use a bead-stringing kit to spell out your phone number while adding other fun beads around it. Then, if they become lost, they have easy access to your phone number. 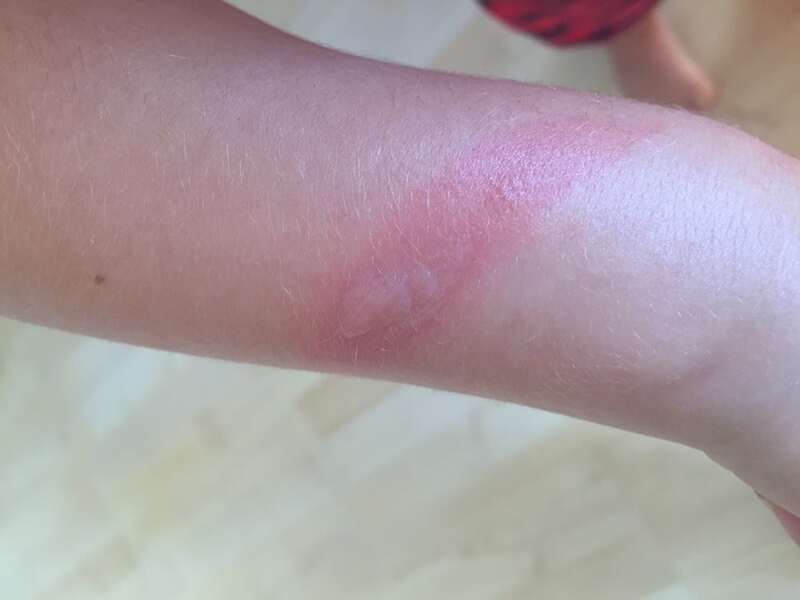 If your kids suffer a burn, soak a small towel or cloth in vinegar and apply it to the area. Leave the cloth on until the skin is cool to the touch. In addition to cooling the burned area, the vinegar should help ease the pain and prevent blistering. Make a paste with baking soda and water, and rub it on the site of the splinter. It will eventually push itself out in a few minutes. You can use tweezers to help in removing the splinter if needed. 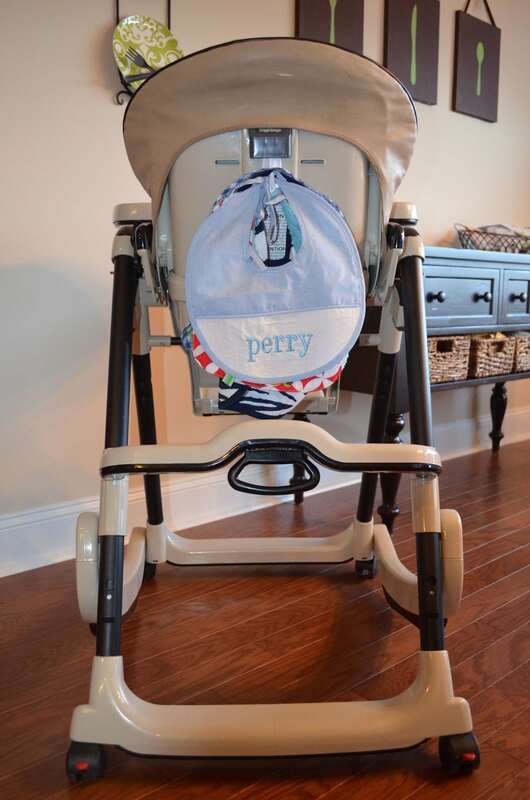 Attach a large command hook to the back of your child’s high chair. Hang bibs from the hook for easy access when you need one. You can also hang other items from the hook if needed. Help your kids overcome their fear of monsters by making a bottle of monster spray. 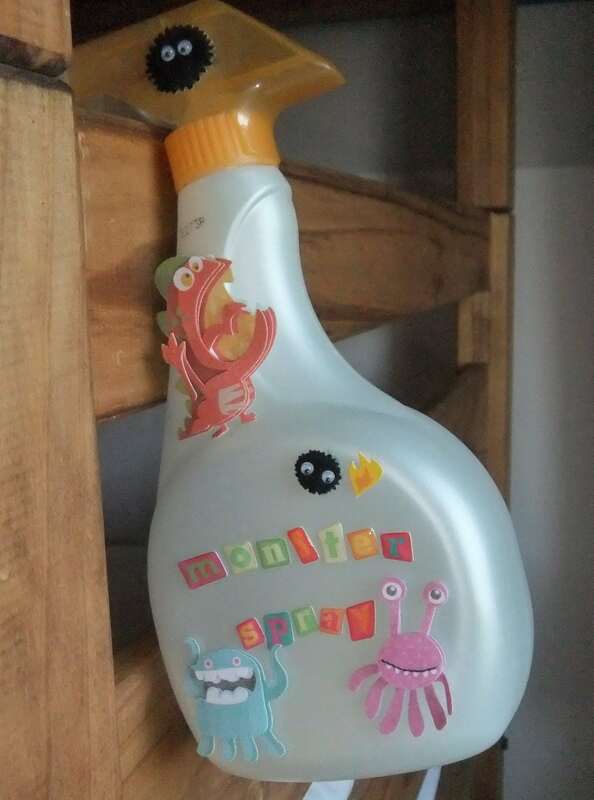 Simply decorate a clean spray bottle with colorful stickers. Then add water and essential oils to create a nice smelling spray for driving away any monsters at bedtime. Toothpaste works wonders when removing permanent marker from wooden furniture. 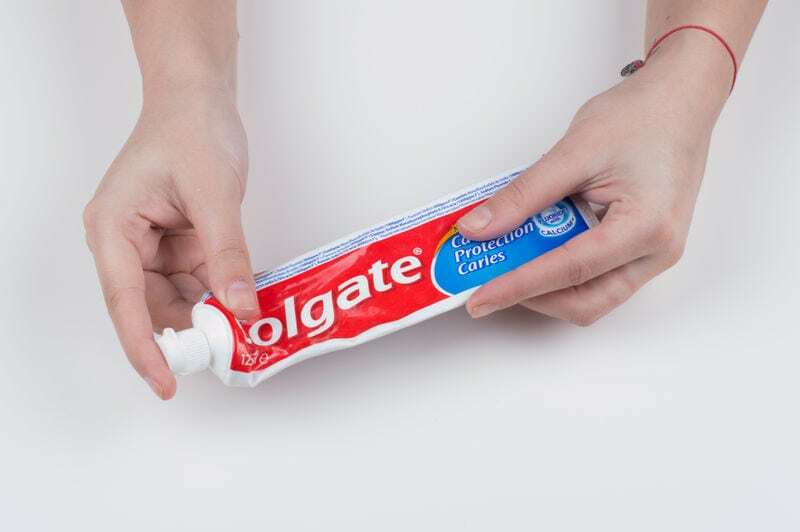 Make sure to use normal toothpaste and not the gel, applying it directly to the marker. Rub the area using a damp rag, rinsing the rag and continuing to rub until the toothpaste and stain are gone. Put stickers in your kid’s shoes so they know which one goes on the left foot and which one goes on the right foot. 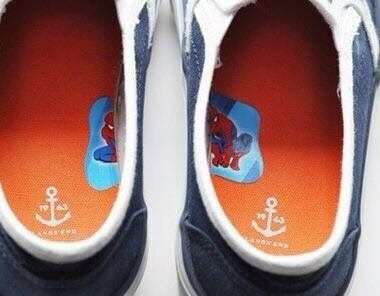 Simply cut a sticker in half and affix it to the inside of each shoe interior. Make sure to explain to your child what the stickers are for so they understand their purpose. 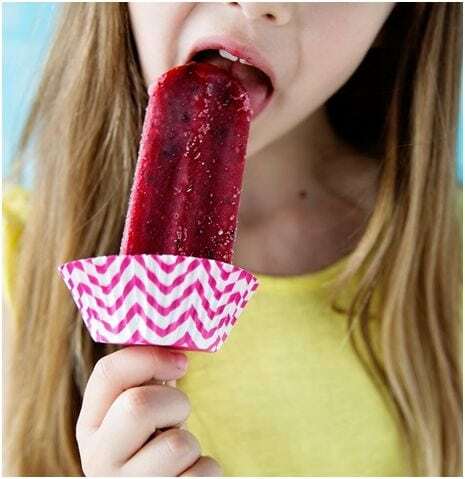 Insert the stick of a Popsicle through the bottom of a cupcake liner. This should prevent the Popsicle from dripping everywhere as it melts. When finished, throw the Popsicle stick and cupcake liner away and wash your kid’s hands. Wrap a rubber band around the top of your lotion pump to prevent your kids from using too much lotion. Make sure to test the position of the rubber band to make sure that your kids can still get enough lotion out when using the pump. Adjust as necessary. 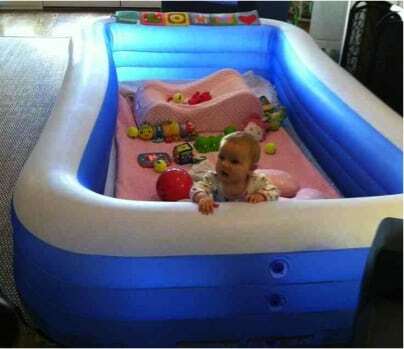 If you have a small child, place a blown-up kiddy pool in their play area to give them a safe place to play. Fill the pool with toys once inflated. Make sure to check on your child from time to time to make sure they stay out of trouble. Parents always need extra pacifiers. You can store them in portion containers to keep them clean. 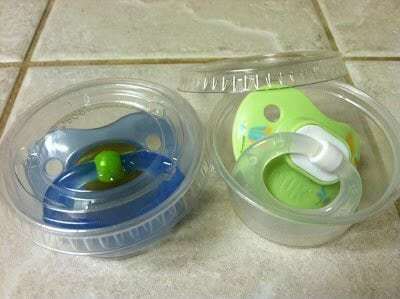 Place the containers in your purse or a diaper bag for easy access when needed. 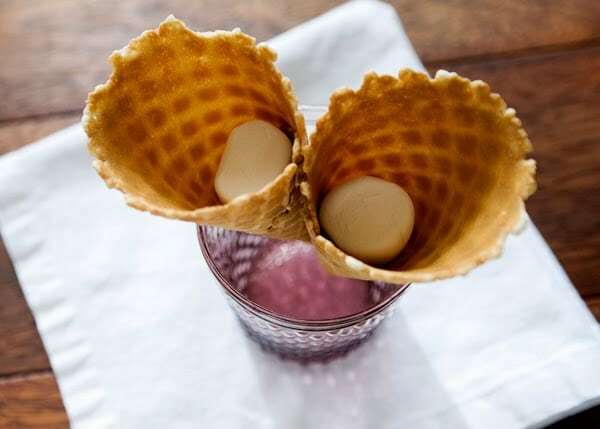 Before scooping ice cream into a cone, place a medium-size marshmallow half into the bottom of the cone. This should prevent the melting ice cream from soaking through the cone and dripping onto the floor. When finished, they can eat the marshmallow. You will always be prepared to keep your kids occupied with a stash of crayons. An Altoid box is the perfect place to store them. You can hide some pieces of paper in there as well. 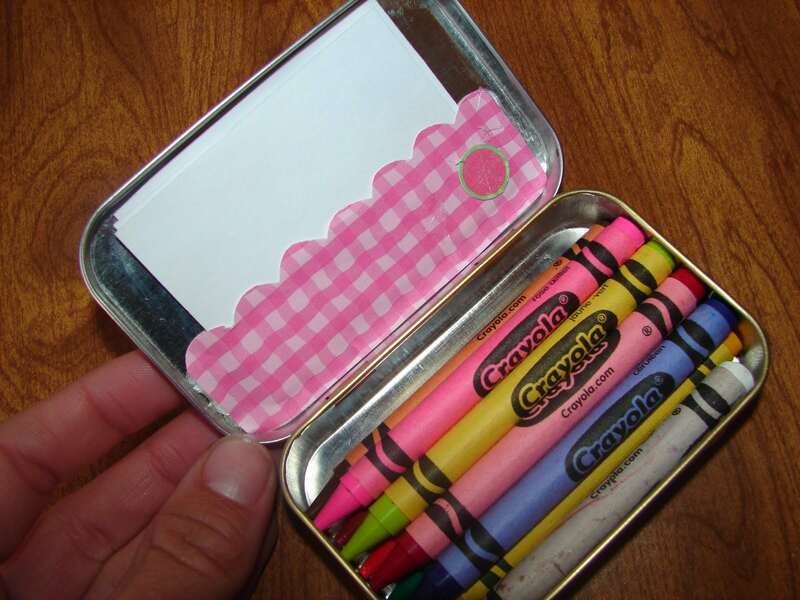 Keep the tin out of the sun, or the crayons inside will melt. An easy way to clean and disinfect toys is to place them inside the dishwasher and run a cleaning cycle. Make sure the toys are completely dry before giving them back to your kids. You can also wash their shoes this way. 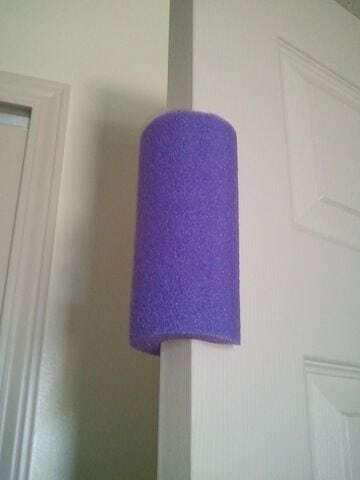 Cut a pool noodle and put it on your door to prevent kids from getting their fingers caught. That way, if they try to close the door, it will not close on their little fingers. Make sure to place the pool noodle high enough so that they can’t easily remove it. To keep all of your kids’ socks together, place them in a laundry bag prior to washing. Then, place the bag in the washer, making sure to zip it up. 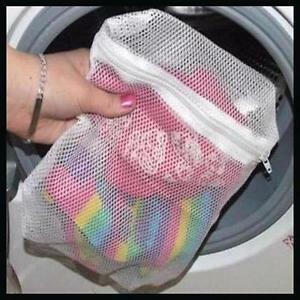 You can even place the socks in the laundry bag in the dryer to keep them together while drying. Fill a small bottle with 2 tablespoons of fabric softener and water to detangle doll hair. 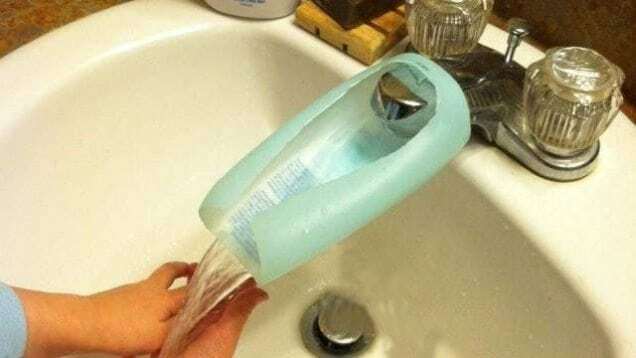 Dish soap and hair conditioner works too! 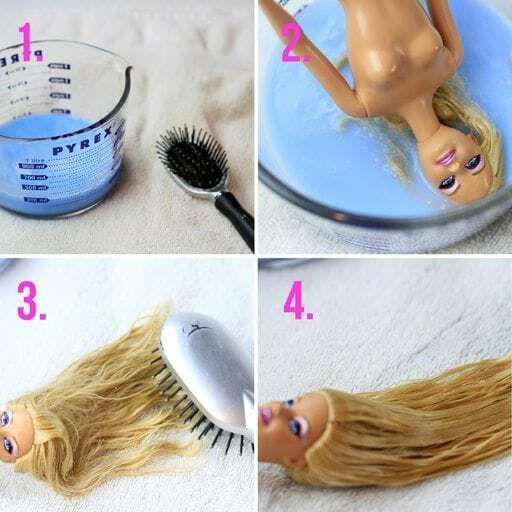 Spray the mixture directly onto the dolls hair and brush through using a brush. To make a cool tent for your child, attach a bed sheet to a hula-hoop in three sections using duct tape. Flip the hula-hoop over, cut small holes through the bed sheet material and the tape, and then attach twine directly to the hula-hoop. 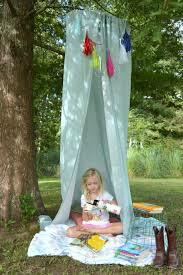 Use the twine to attach the tent to a tree or hook. 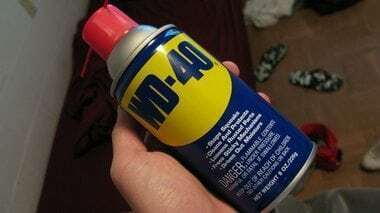 WD-40 will help you get crayon off of your walls. Spray the area of the wall with crayon marks, and wipe away with a clean cloth. WD-40 also removes crayon from a variety of other surfaces, including plastic, glass, and concrete. 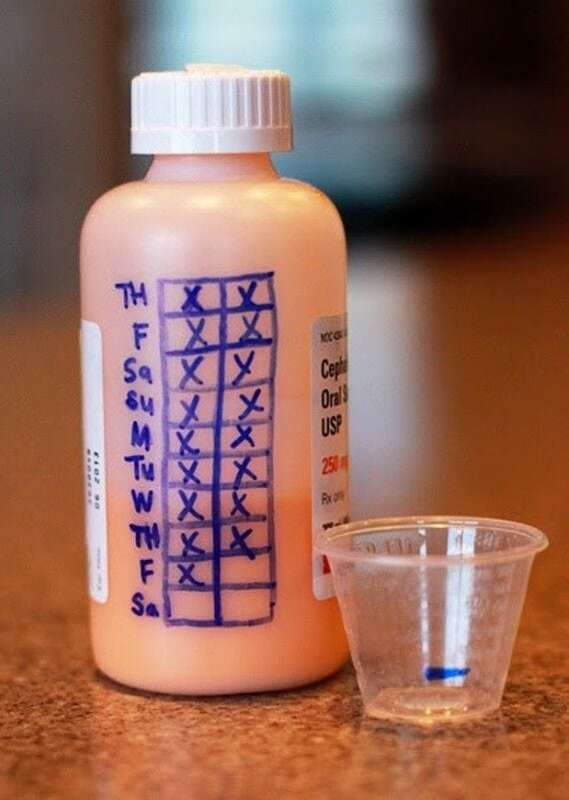 To make sure that you give your kids the proper dosage of medicine at the appropriate times, draw a little chart on the side of the medicine container. Make sure to include boxes to check off for every day they have to take it. Then, mark off each day until the medicine is finished. 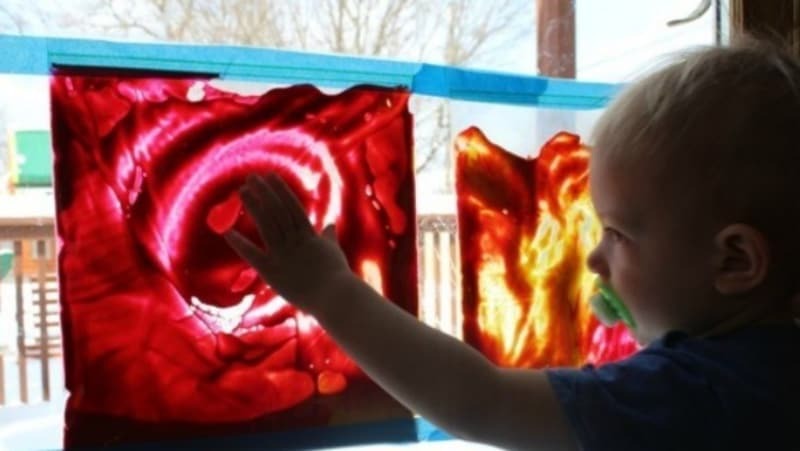 Add some paint to the inside of a zipper seal bag, and let your kids swirl the paint around with their fingers. Tape the bag securely to a hard surface, such as a wall or window. Use water-soluble paint for easy clean-up just in case your kids spill the bag’s contents. 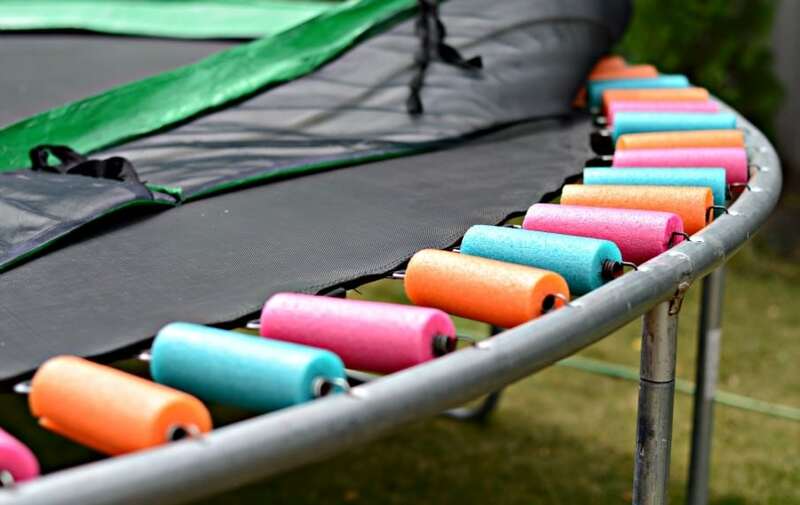 Trampolines are fun, but they contain parts that can cause kids harm, such as the area with the springs. Cut some pool noodles to a large enough size to cover these springs. The pool noodles should keep your kids from getting hurt if they fall on the springs. 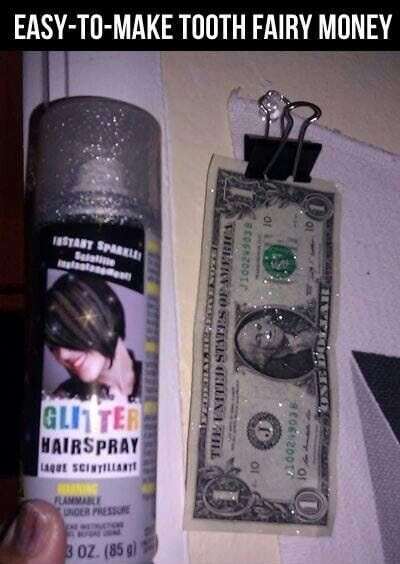 Use glitter spray to make money from the tooth fairy even more magical. Simply leave some sparkles on the money left under the pillow and say it’s from the tooth fairy. Just make sure to wash your hands afterwards or you may face some awkward questions. 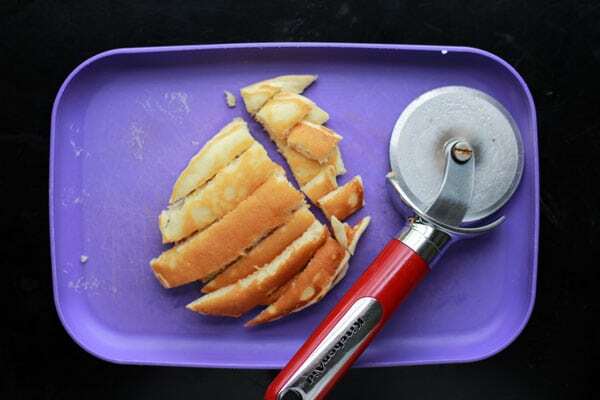 To quickly cut a pancake into a smaller bite-size for your toddler, use a pizza cutter. Lay the pancake on a plate or other hard, clean surface and cut away. Wait to put on any syrup until after you have cut the pancakes. 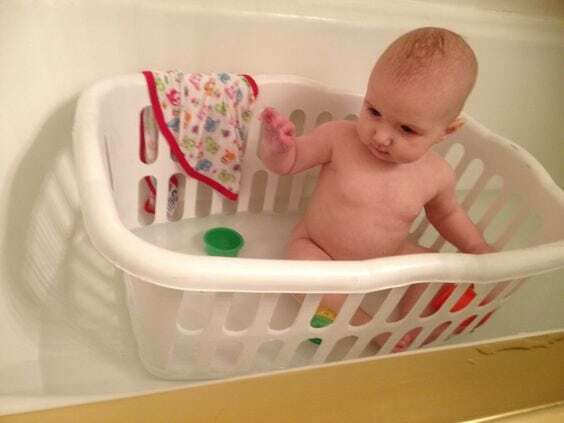 Prevent your toddler from moving around too much in the tub by letting them sit in a laundry basket. You can place any toys they like to use in the basket to give them something to keep them busy while you wash them. Use a plastic cup to wet and rinse their hair. Kids tend to always get a new cup when getting a drink and then leave them lying around. 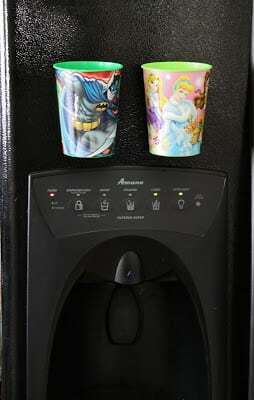 You can give them their own cups with magnets attached to make it easier for them to keep up with them. When finished drinking, tell them to stick their cup to the refrigerator for later use. 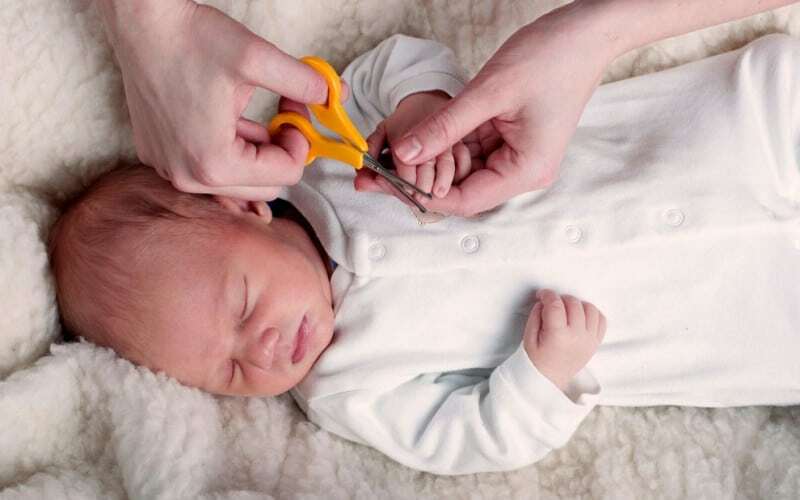 Babies and young children often squirm and move about when you try to cut their nails. To avoid the stress involved in such an endeavor, wait until they fall asleep to cut their nails. This allows you to more easily cut their nails without worrying about them getting hurt. Cut up an empty lotion bottle to create an elongated spout for your kiddies who can’t reach. The spout runs the water further out from the faucet so that smaller kids can easily reach it. Keep in mind, you’ll still probably need to turn it on for them. One drawback of car seats for small infants is that you can’t see them in the back seat when you’re driving. 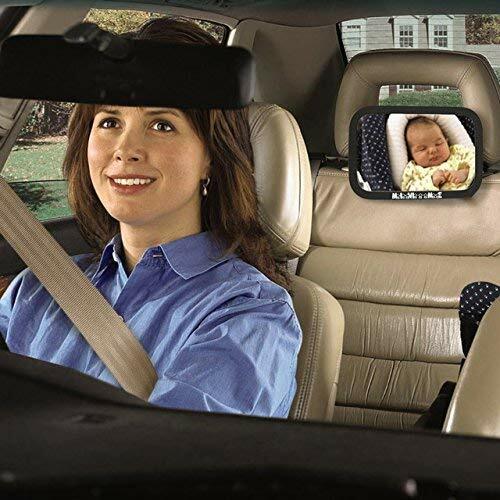 Installing a specially designed baby mirror in the back seat of your car allows you to easily monitor them while driving. In addition, most baby mirrors are designed to keep them entertained while they are awake. Just remember to keep your eyes on the road. An easy way to keep your kid’s school lunch cool is to use frozen sponges. 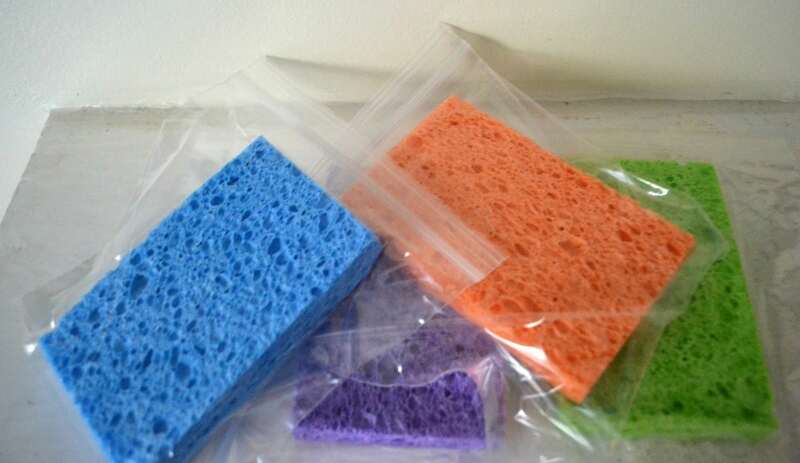 Freeze a sponge, place it in a sandwich bag, and toss it in your children’s lunch box to keep their lunch cool. The sponges also come in handy when you need an ice pack in an emergency. To keep your kids from getting their hotdog condiments all over everything and making a mess, consider this simple hack. 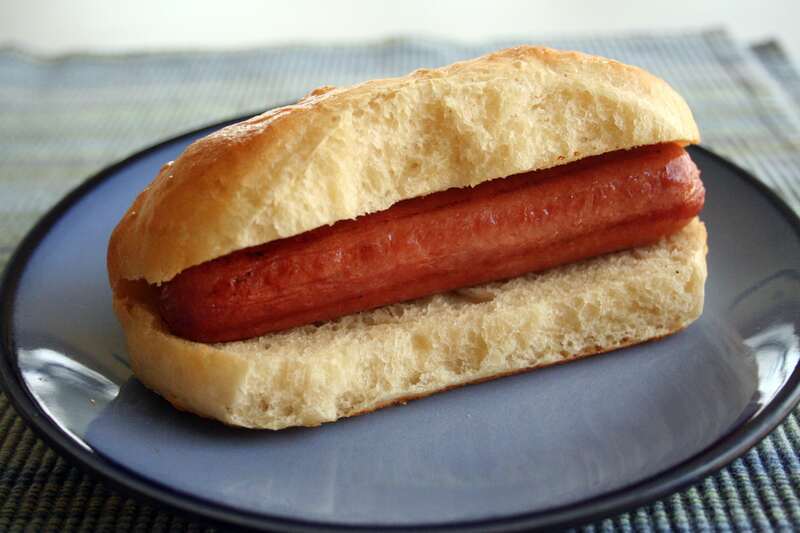 Simply put the ketchup, mustard, or other condiments on the bun first before placing the hotdog in the bun. A fitted sheet makes a perfect awning for your toddler in his or her playpen. This allows you to work outside while keeping your baby or toddler in view. 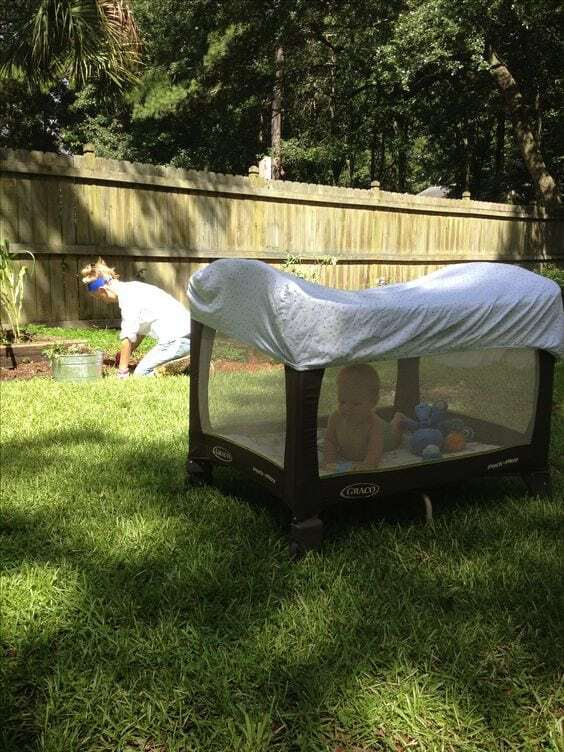 The sheet gives them shade while also keeping out bugs, such as mosquitoes. 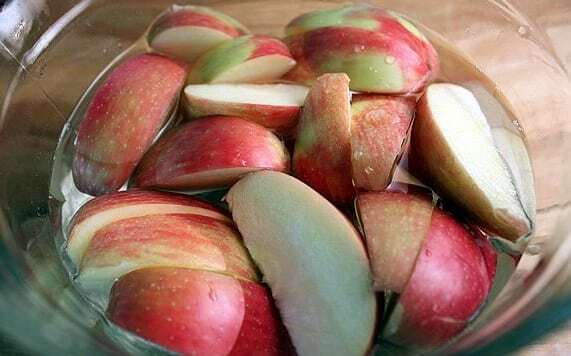 To keep apple slices fresh all day, sprinkle some salt on them before placing them in a sealable sandwich bag. Then, wash the pieces off before giving them to your kids as a snack. The salt should keep them fresh and from turning brown. Use a hot glue gun on the bottom of shoes and slippers to prevent slips. 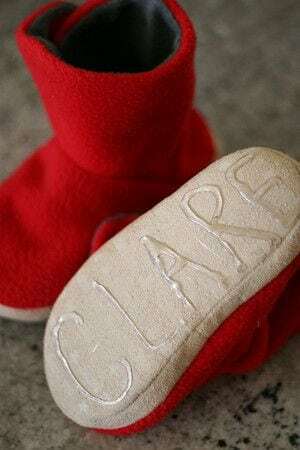 Simply turn them over and write their name or apply a pattern using the hot glue. Allow them to dry thoroughly before placing them on your kid’s feet. If given a cup with any kind of liquid inside, a kid will invariably spill it. To prevent this, place a piece of plastic wrap over a small cup to keep the juice or other drink inside. 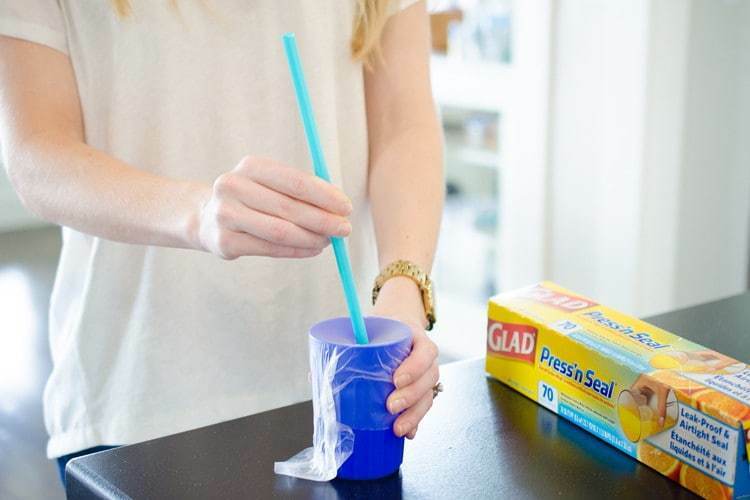 Stick a straw through the plastic wrap for easy access when drinking. Glitter is no match for a lint roller. Use it to clean up spills. 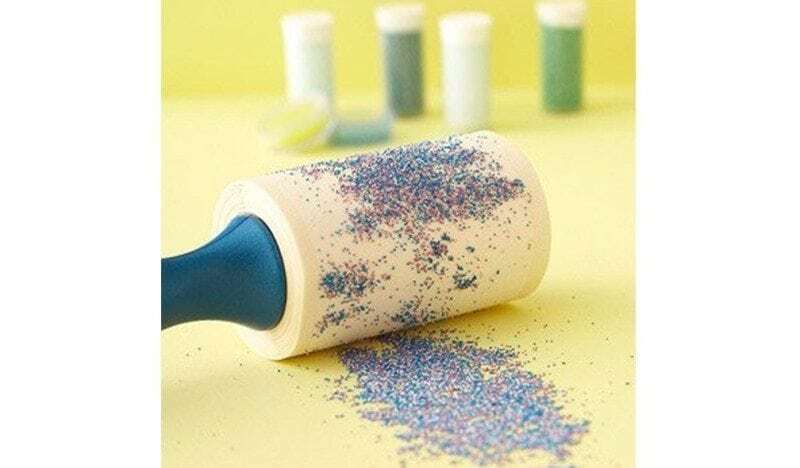 When finished cleaning up the spilled glitter, remove the glitter-filled tape from the roller and throw it in the trash. Kids are tough on their footwear, especially if they play outdoors a lot. 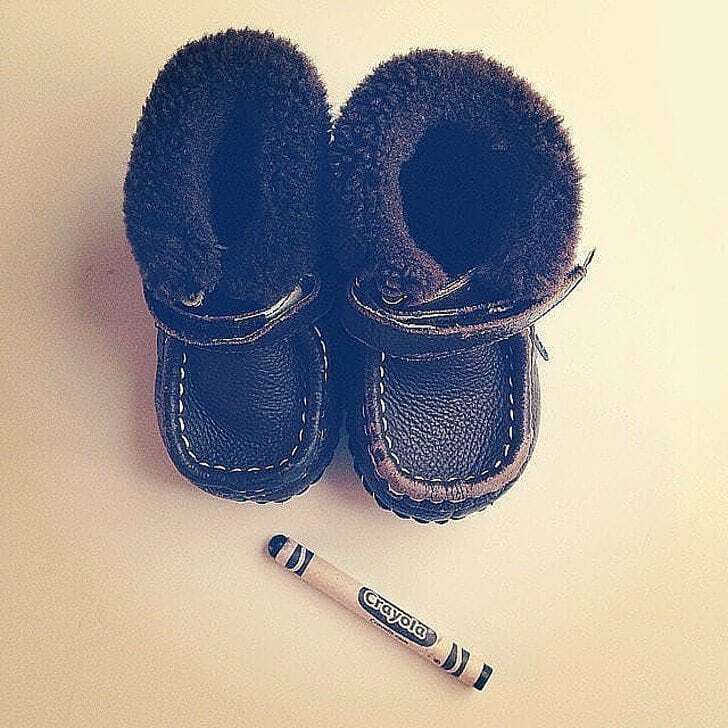 Luckily, you can use a crayon to repair scratches on their shoes. Just make sure the color of the crayon matches that of the shoes before applying. A parent’s worst nightmare is losing their kid in a crowd while away from home. To help find them when lost, you can write your name and phone number on your child and then paint it over with a liquid Band-Aid so it stays. That way if the area gets wet, your name and number should remain.